This series in intended for those students following advanced level social biology and related syllabuses. Each text deals with a specific topic area and the series as a whole provides a stimulating introduction to a subject of growing importance. The control of disease and the active encouragement of good health is a major priority of nations worldwide. This book gives a detailed study of a number of diseases and health problems from which common themes and underlying principles emerge. 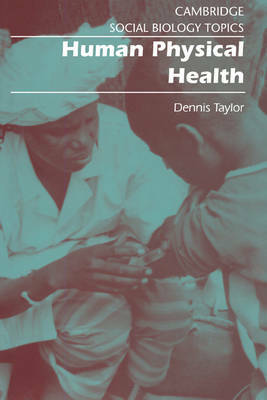 Details of transmission, treatment and control are covered as well as epidemiology and sociooeconomic factors - particularly the implications of AIDS. Topics range from infectious diseases, pulmonary disease and malaria to immunology, transplantation and physical fitness.